Thread: New Drip Machine Suggestions? My old (and faithful) Krupps has died and it seems this is not an Australian model (I bought it in HK). I am looking for a replacement with a few more options like a timer and combo grinder. Friend from Japan recommended the Cuisinart but this looks like a US/110v only model as well. I visited a few places locally like the Good Guys, Bing Lee and Bunnings but they had predominately capsule type espresso machines with only 1 or no example in the drip-machine line. So I am looking for recommendations from anyone who cares to share an opinion. If I can buy it online that would be even better. How about the Behmor Brazen which is available on Coffee Snobs' website? I'm saving up for one as I predominantly drink brewed/pour over coffee. The most highly recommended drip brewer around here would be the Behmor Brazen Plus. It has no built-in grinder but it has everything else including brewing temperature and bloom time adjustments. Beat me by this much! This looks great - pour over drip machine sounds perfect. Thank you. I can hardly wait to get one myself! Wife got me one for our wedding anniversary - thumbs up from me! Thanks everyone for your suggestion. Andy and matth3wh like this. The first thing you need to do is to learn how to set the timer (easy). I wake-up to the smell of fresh coffee in the Brazen every morning... stagger down the stairs, follow my nose, pour a cup and enjoy. Then do the normal morning rituals but always walk out the door with the second cup poured into my travel mug. coffeechris, Dimal, matth3wh and 1 others like this. Have to agree with Andy and everyone else here who have said the Brazen. Easy to use, easy to set and mainly it brews/produces a better cup of coffee than any other drip. I have had over 10 different drippers in my time. Yes some make more at once and others might be cheaper. However you cant go wrong with the Brazen. matth3wh and TC like this. +1 for the Brazen. It one the 2016 MICE Innovation Award for good reason. When you look at what it's does you will see that it's excellent value. I've been enjoying Brazen coffee for the past week while visiting my brother in WA. Very keen to get one after this experience. He's replaced his with a substitute silicone lid and is happy. Anyone else with smelly lid brewers? I have been using two since Andy made them available and have only ever experienced caffeinated heaven in the cup. I've got a very sensitive nose and have never noticed any such smell on mine. How do they go making 2 cups, say 4-500ml rather than the full 1200? Would the 35g of grounds cover the bottom of the basket? I regularly do batches with 600ml of water and 33g of grounds using a paper filter and it works fine. matth3wh and trentski like this. Hi Javaphile. I'll try out your recipe tomorrow. Any particular beans you've found particularly tasty through the brazen? Got the Brazen in the mail today and could smell a low strength factory plastic smell when heating from the lid. Didn't effect the result in the cup but Ben who I got it off also mentioned smelling it. As its only new and only had one or two brews run through it so I've given it a further clean off and will see what tomorrow brings. Will take it to work training sessions next week and share the coffee love... And so I don't have to cry/gag watching everyone drink Int. Roast caterers blend. 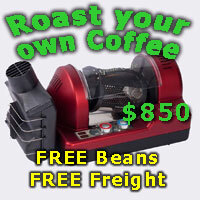 Lighter roasted Yemen and Ethiopian beans with a big berry blast are great. A brew temp down around 89C or 90C works nice for many of these types of beans. I use F for the temp scale as it allows finer tuning so I typically run around 192F. You'll have to experiment to find the grind and temp that works best for your bean, altitude, and tastes of course. Quick followup - what's the best way to clean this machine and how often should I be doing it? My old machine I use to run vinegar through it every six months and then flush it with water. Reasonable? So I have had this machine now for six months - and I love it. Having said that I have one complaint. The design of the carafe is such that you have to tip it very far forward to pour the coffee out and because of the design the pour is not smooth, its very choppy/rough especially when you get to the bottom of the pot. I couldn't think of a reason it was designed this way. It seems to me it would have been fairly easy to add a proper spout with a button controlled seal like many modern thermoses. So was curious if anyone has any idea?